Affordable Zero Energy Homes: A Balloon Framed Wall does it All! We’ve discovered that a double 2×4, balloon framed, an exterior wall with dense pack insulation performs at the highest level – satisfying both demands of thermal and fire blocking performance and cost-effectiveness. Not only that, the less I depend on using foam, the more relaxed my clients seem to be when building affordable zero energy homes. There are a few challenges with a double framed wall system. Note: Individual builders can get pretty creative with how they choose to “fire stop” all the open shafts between floors, but before they just charge ahead and do it their favorite way, I’d recommend confirming that the local building inspector will sign off on it. Sometimes, when building a double 2×4 exterior wall, builders have to designate which wall will bear the weight of the house. Sometimes it may be the outside wall, but not always. Sometimes it may have to be the inside wall. For example, when installing an ICF foundation with up to 3” of Styrofoam on the outside of the concrete wall, the outside 2×4 wall (assuming it will align with the outside of the ICF) will merely sit on a cantilevered 2x12PT sill plate that also serves the inner support wall. In this way, the outer wall is “tagging along for the ride – like a curtain wall” and the inside wall is doing all the work. This is important to know because all the window and door headers must be installed on whichever wall is the bearing wall. It is my preference to tie both 2×4 walls together at two or three points between the floor and ceiling. The first reason is that 2×4 studs can be crooked and if I string a line across the center, halfway between the floor and ceiling, I can straighten the face of the interior wall. The second reason is that I feel better knowing that both walls are connected and not working independently of each other. I do this by using ½” x 6” x 11 ¼” plywood gussets. Builders learn quickly that it’s very important to remember that both inside and outside studs must align with each other so that the gusset is easy to install. Wherever a double framed wall encounters a window and door opening, I prefer to install a ½” x 11 ¼”- wide ZIP-ply band around the inside of the rough opening. The plywood serves as an air barrier and provides a solid connection between both walls for installing the door or the window. It also holds the wall together, thus providing a stable sub-plane for trim to attach to. Unless the two independent walls were connected in the middle, they could move or twist slightly over several years of drying out, and this would wreak havoc with jambs and casings. When using this system to frame door and window bucks, it’s very important to remember to compensate the rough stud opening size to allow for the additional thickness of the plywood. However, if you do forget, I promise that you won’t forget twice. Ask me how I know. Installing floor systems inside a balloon-framed wall can be tricky, especially where the builder must provide structural stamped plans with his permit application. In most states and communities, builders have to submit plans for Energy code & Environmental compliance as well as for structural and fire/safety review. We have found that the one category of construction that engineers get cross-threaded in relation to balloon framing is in how we propose to hang our floor system on the inside face of the stud wall. They are very accustomed to “stacked or platform” framing techniques, but the revival of balloon framing is stirring things up in the halls of local building inspectors. Normally with conventional framing techniques, the first floor would get built and then the second floor would sit on top of it. This is called “platform framing.” But with re-introduction of balloon framing, the floor systems are sometimes hung on the face of each stud. This is so that the wall cavity can be completely filled with dense pack cellulose from the foundation to the roof without any framing penetrations; not even a floor system. We attach our floor systems to a Microlam “rim” that is bolted to every stud at 24” on center. The joists are then attached to the rim with joist hangers; much like you would add an exterior deck onto your house. Some engineers are ok with this. Others want me to beef up the carrying studs to 4×4’s instead of 2×4’s. When I ask them “Why?,” all I get is, “Because it makes me ‘feel better.’” I always thought that engineers relied on math, but I’m learning that they get insecure too, even when the math works. Since they are the ones who have to sign off in order for me to get a building permit, I just do what they tell me to do.COST EFFECTIVENESS – We build two different high-performing walls. One wall system that we use, when a double 2×4 wall just isn’t practical because of limited space, is a single 2×6 wall framed at 24” on center, with ½” ZIP Wall on the outside and an additional 2” of Styrofoam. Then we spray 4 ½” of closed cell soy- based foam between the studs. This gives us an R-40 wall. The other wall system that we like to use is the one we’ve been talking about. It’s constructed out of two independently framed 2×4 walls that have a 4 ½” space between the walls and approximately 11 ¼” of total cavity thickness. Other than small plywood gussets at several intervals between the floor and ceiling and a top and bottom plate, there are no thermal bridges. This essentially provides a 12”-thick wall around the perimeter of the house which is also filled with dense pack insulation. This wall can perform as high as R-45. Very little foam is used in this wall system, except where electrical boxes and wall penetrations need to be sealed up and at corners where the exterior walls join together. These spaces are also filled with foam. We are often asked to calculate the difference between using the two wall systems. So we estimated two 100’-long x 8’-high wall systems; each with 4 windows and two doors. 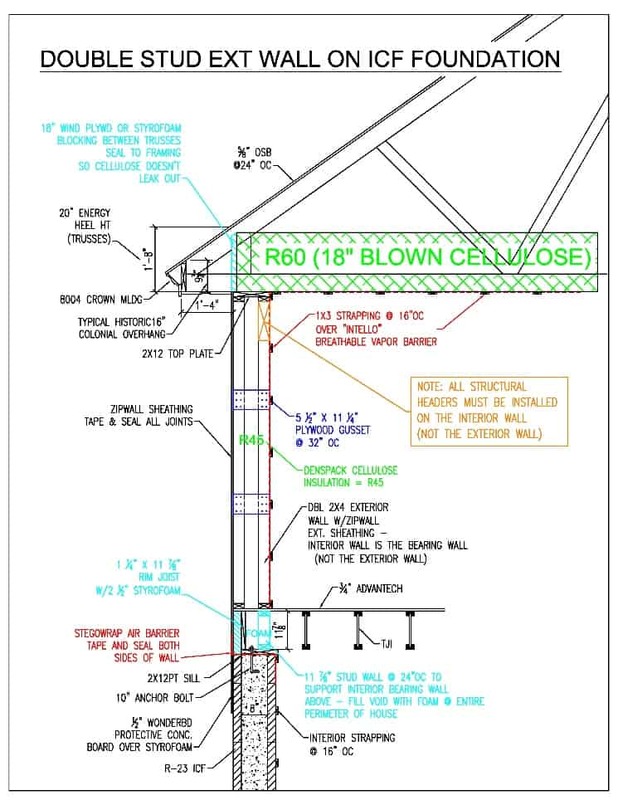 We determined that the cost of using the single 2×6 wall with 4 ½” of closed cell spray foam between studs with 2” of Styrofoam on the outside cost about 14 percent more than going with a double 2×4 stud wall with 11 ¼” of dense pack cellulose insulation. Both wood-framed high-performance wall systems have their place and we use both; sometimes in the same house. But I think I can speak for my crew and say that we like the double wall best. It frames quicker, all things considered. Plus, it has a higher R-value and we can install dense pack insulation in extreme cold. Oh yeah, and how could I forget the fact that, with a double wall, you also get really deep window sills! All cats and dachshunds rejoice!